Freezer's Perfect Silicone Ice Cube Trays are the perfect addition to every kitchen! Freezer safe from -40 up to 464 degrees Fahrenheit. The possibilities are endless! Open and wash the trays before use. They are dishwasher safe. The first thing I notice about these trays is how sturdy silicone they are. I had no problem holding them with only one hand and filling them. 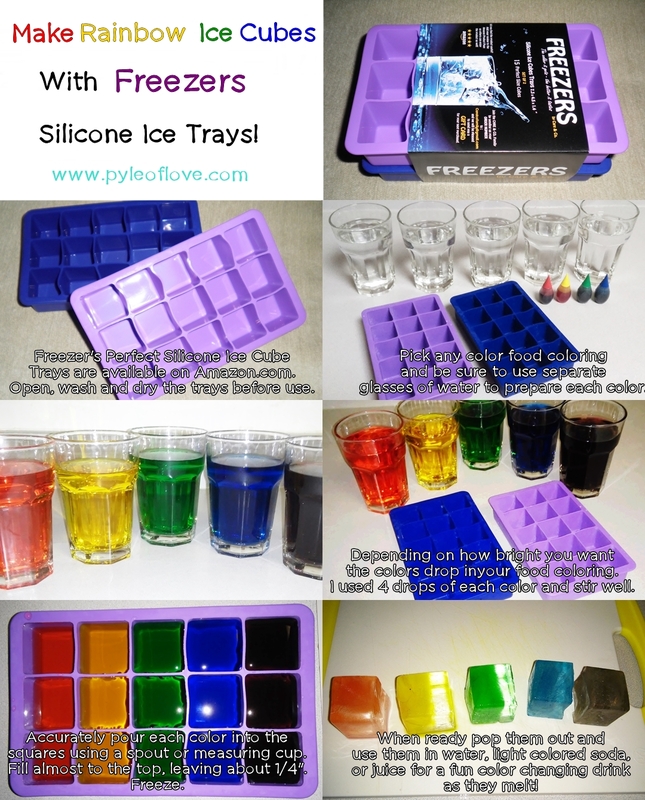 Popping out the ice cubes will get easier the longer you use it, as with any silicone mold. By about the 9th time I've filled them they pop out as soon as I turn the tray over so don't be discouraged if they don't dump right out the first few times. I love how each square is a perfect 1.25" giving you perfect little square cubes for any drink. I have used other silicone trays in the past that were so flimsy you had to put a pan under them to keep from bending or collapsing, not these! During freezing you don't need a lid, they stack perfectly right on top of each other with no issues. I highly recommend these trays and know you will like them as well! Check out my video to see them in action! 1. Pick any color food coloring and be sure to use separate glasses of water to prepare each color. 2. Depending on how bright you want the colors drop in your food coloring. I used 4 drops of each color and stir well. 3. Use a measuring cup to accurately pour each color into the squares. Fill almost to the top, leaving about 1/4". 5. When ready pop them out and use them in water, light colored soda, or juice for a fun color changing drink as they melt!